The impressive Chateau Ducru-Beaucaillou sits on the banks of the Gironde Estuary in the appellation of Saint-Julien. The 245 hectare estate, with 100 hectares planted with vines, has been owned and operated by the Borie family, who resides at the estate, for over 60 years. The vines have an average age of 35 years and have a root depth of about 6 meters. This allows them to withstand climatic difficulties by penetrating deeper into the earth. The vines are then able to draw more nutrients and water from the soil and the subsoil, thus producing more complex and distinctive wines at Chateau Ducru-Beaucaillou. The planting density of the vines plays an equally important role, as it triggers competition among the vines and their roots. The resultant harvest is thus smaller and the vines must be more aggressive in their search for nutrients. 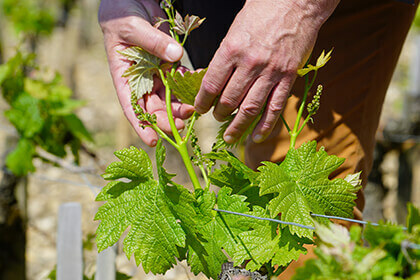 Carefully tended and picked only by hand, the vines are treated with extreme care and receive lots of attention. The unique name of Ducru-Beacaillou is derived from the "beau caillou", French for "beautiful stones" which are abundant in the soils of the estate. The Gironde has moderating effect on the climate of the estate creating milder winters and cooler summers, which allows the grapes to have a more homogeneous growing season that favors the production of a "grand vin". Chateau Ducru-Beaucaillou wines have a lovely density of fruit, complexity and supple tannins stylistic to the terroir of Saint Julien. Expanding over 75 hectares in the noble Saint Julien appellation of Bordeaux’s Left Bank, Chateau Ducru-Beaucaillou is one of the most emblematic properties of the Medoc. Here, a privileged terroir of large, well-draining stones (which appear in the name of the property, translating directly to “beautiful stones”) are expressed through two signature wines: Ducru-Beaucaillou and Croix de Beaucaillou. The estate proudly bears the title of 1855 Second Classified Growth and is currently managed by the charismatic Bruno Borie, third generation of his family since his grandfather purchased the property in 1941. The history of Chateau Ducru-Beaucaillou dates back to the year 1720, when it was first purchased by the Bergeron family, one of the 5 families whose legacy is closely tied to the estate and its wines. In 1795, following the French Revolution, Bernard Ducru bought the property and added his family name to it. Ducru also invested in improving both the vineyard and cellar, commissioning a Parisian architect to rebuild the existing chateau in a chartreuse style. 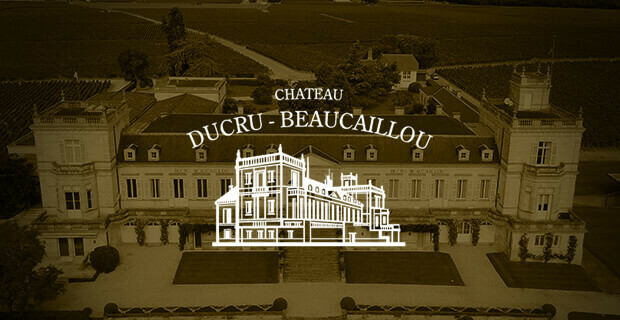 In the famous 1855 classification, Chateau Ducru-Beaucaillou became a Second Growth, earning a privileged title that is today shared by only 15 Bordeaux estates. In 1866, the property passed to the Johnston family, when Lucie-Caroline Dassier (wife of Nathaniel Johnston) purchased it for one million francs. Johnston eventually became a very influential person in the region, even serving as mayor of Saint Julien between 1903 and 1908. Johnston and his vineyard manager at the time, Ernest David, were also credited with inventing the “Bordeaux Mixture,” a copper-based vine treatment to protect the plant from mildew. Johnston’s second wife, Princess Marie Caradja of Constantinople also contributed to the aesthetic the chateau enjoys today, redesigning the building to add a Victorian tower and surrounding it with a picturesque park planted with exotic flora. In 1929, the Economic Crisis forced the Johnstons to sell the property, which was acquired by the Desbarat family of wine merchants. The Desbarats kept the chateau for only a decade before World War II erupted, forcing the family to sell. In 1941, another wine merchant by the name of Francis Borie bought the estate. Borie already owned property in Pauillac, which he handed down – together with Ducru-Beaucaillou - to his son, who in turn divided the family property between his three children. Francois-Xavier Borie would take over the Pauillac Fifth Growth Grand Puy Lacoste, while Bruno would become managing director of Chateau Ducru-Beaucaillou, owning it with his sister. Working closely with consultants Jacques and Eric Boissenot, the team has in the past decade focused their attention on their work in the vineyards, gaining stricter control on the detailed plot-by-plot selections. 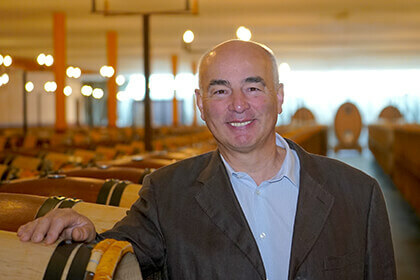 Borie has also relied on his international perspective and experience gained from over 20 years owning the Lillet aperitif brand, along with his natural charisma, to further enhance the global reputation of Chateau Ducru-Beaucaillou and its signature wines. The terroir of the Ducru-Beaucaillou estate has for centuries been considered the most important ingredient in the production of its wines, as evidenced by the estate’s distinctive name. “Beaucaillou” refers to the “beautiful stones” gracing the vineyards, which offer several advantages to vine cultivation. The stones encourage water drainage, reflect sun onto the grapes, store heat from daytime to release at night and blocks moisture from escaping, preventing the ground from drying out during the summer. The 6-8 meter layer of Gunz Gravel was deposited in this area by the Garonne in the Quaternary period and is quite typical of the Saint-Julien terroir. Below the gravel level is a tertiary substratum of Oligocene mud and Eocene limestone deposits. The vines, 35 years old on average, grow right on the banks of the Garonne. The vines’ proximity to the river is very beneficial to the plants, since the water regulates the temperature and protects the vines from frost. The 75-hectare estate is planted at around 10,000 feet per hectare on average, with 70% of the vines dedicated to Cabernet Sauvignon and 30% to Merlot. The harvest and vinification are carried out on a strict plot-by-plot basis, with the plots divided according to topographical differences. In the future, the team plans to transition to cluster by cluster vine management using advanced electrode and GPS technologies. Following a manual harvest, the grapes are sorted in the vineyard on mobile tables in order to prevent unhealthy grapes from touching healthy ones during their transportation to the vat room. In the cellar, which is located directly below the chateau, the plots are treated separately through the fermentation process. The fruit undergoes a gentle extraction and malolactic fermentation in the vats, after which the press wine drains directly into the barrels. The estate’s emblematic blend contains 70% Cabernet Sauvignon and 30% Merlot, reflecting the proportion of vines planted to each grape variety. The wine used for the Ducru-Beaucaillou is matured for a period of 18 months (as is typical for the classified growths of the Medoc) in 90% new oak, while only 60-70% new oak is used for 12 months in the case of the Croix de Beaucaillou. The latter wine is made from a completely different plot of vines, with their own unique characteristics and equally high level of quality. In fact, around 50% of the total vineyard property is dedicated to Chateau Ducru-Beaucaillou, while 50% is used to make Croix de Beaucaillou. The wines mature in 225L Bordeaux barrels of French oak sourced from 5 carefully chosen cooperages and are bottled with corks made from 5 specific cork-makers in order to ensure consistently high quality. 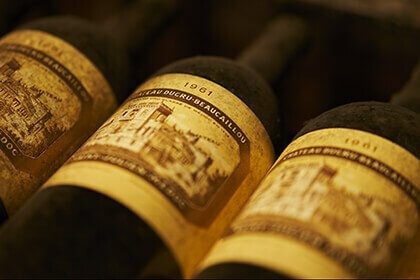 The wines of Chateau Ducru-Beaucaillou are widely considered the most quintessential of the Saint Julien appellation. The gravel-rich terroir produces deeply colored, ripe and powerful wines that are beautifully balanced. 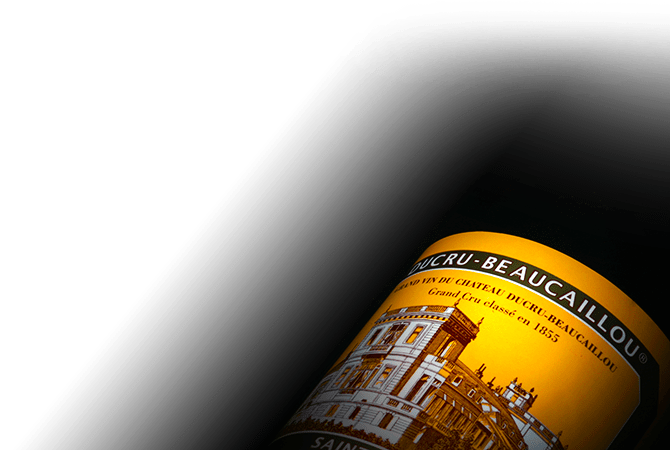 Chateau Ducru-Beaucaillou is known overall for its balance and elegance, holding together a fantastic concentration of ripe black fruit flavors with surprisingly fine and elegant tannins. The additional bit of Merlot in the La Croix de Beaucaillou lends it a certain panache, along with hints of cassis and chocolate. The perfect addition to any collection, these wines are made to age at least 10 years in the bottle, and significantly longer for the better vintages. The complexity, elegance and majesty of fruit in the wines of Chateau Ducru-Beaucaillou make them the ideal pairing with a wide array of dishes. In fact, Bruno Borie is known in Bordeaux for his passion for cuisine and often invites clients to the chateau’s professional kitchen to present recipes that pair exquisitely with the estate’s two wines. Try a bottle of Chateau Ducru-Beaucaillou 1995 with foie gras poele or a juicy entrecote, served Bordeaux-style!